I Love the Smell of Ink and Paper in the Morning began life in the cellar of my house about two days before a day long print workshop at Small Town Ink, a one day celebration of traditional print at Leeds University which would see hundreds of people queuing up to print the fledgling poster on our ancient Vandercook proofing press. 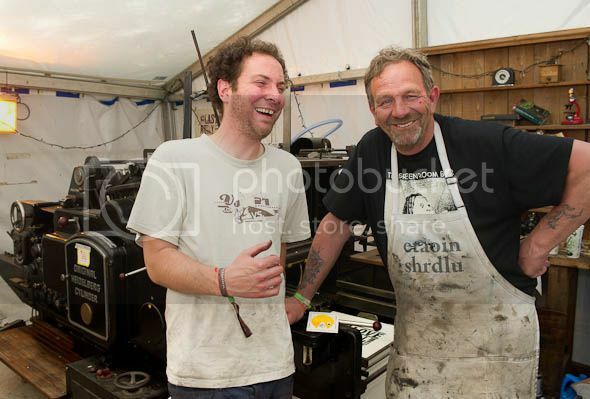 A little while later we went to Glastonbury Festival and the suggestion was made to get it on the Heidelberg whilst we were figuring out how we were going to print a newspaper in a field surrounded by 200,000 people after the Intertype had blown up. Its really hard to know how many were printed as we never kept track. 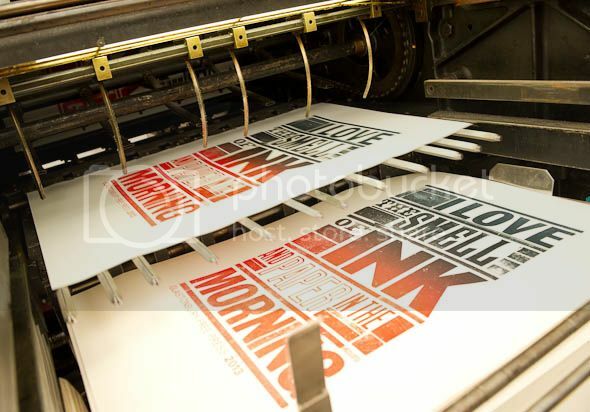 Once they sold out more were printed in a variety of split ducts, giving rise to the never heard before term of ‘letterpress printing on demand’. The poster has since been printed all over the place at various events and it was even changed to ‘I Love The Smell of Ink and Paper in the Evening’ for the opening night of Leeds Print Festival 2014, which was it’s final send off. Or not…John Randle of The Whittington Press then asked if it could be printed in Matrix 32 to accompany an article Pat Randle had written about the Free Press, which meant poor old Pat ended up printing what in my mind is THE BEST version and it haunts/taunts him wherever he goes. And from this we derive great pleasure. There was also a variation of it for a Xmas card for Michael & Emily Eavis. The work of the Glastonbury Free Press team in 2013 ultimately ended up influencing the new visual direction of the Glastonbury Festival website & merchandise, with the new festival logo being taken from a very popular poster designed by Kitty Crossley (and re-imagined by Stanley Donwood). I guess if people buy the copies I have left, maybe one day I will finally be able to retire to a nice house in the country! Help an old fart out and buy them here.